Let me just be annoying here for a moment. Huffington Post reports that James Cameron's new science fiction movie Avatar has taken in a satisfying $73 million in its first weekend. 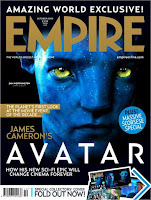 James Cameron launched his science-fiction epic "Avatar" into a safe orbit as the costly film soared to No. 1 with $73 million domestically and $159.2 million overseas, for a $232.2 million worldwide total. Let's be annoying, because in 1978, when science fiction was still a new thing -- in the popular, non-SF consciousness, that is -- lazy journalists could get away with hackneyed references when reporting on science fiction films and books. But we have progressed. SF films and TV regularly rank in the top tiers of box office and audience ratings. Even non-Sf media such as TV Guide regularly feature SF media on their covers. So why does Huffington Post's writer think "launched his science-fiction epic" "into safe orbit" doesn't signal laziness? I'm not being PC; it's not offensive; it is just lazy, and it's part of the reason people don't need to pay much attention to media these days. Apparently, not even to Huffington Post, which was supposed to represent the new media future. Yes, I'm being overly sensitive. But would it hurt Huffington Post to employ a little smart editing?